What's your favorite horror movie car? Some suggestions for horror movie characters: always run into the woods for help when there's a house 20 feet away, say goodbye to your obnoxious "friend" early, and always drive a cool car. What's your favorite horror movie car? 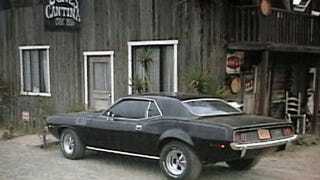 Naturally, it's the 1971 Plymouth Barracuda in Don Coscarelli's 1979 cult classic, Phantasm. The movie car sported a 340ci V8, despite having been cloned to look like the coveted 440 six-pack 'Cuda. Subsequent Phantasm sequels used several different '71s and a '70 convertible, but the kickoff model is still the ultimate Phantasm 'Cuda.